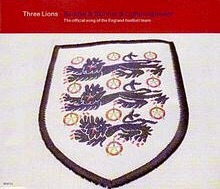 Twenty years ago Euro ’96 was approaching and the single Three Lions had already gone straight in at number one in the UK charts. Today we take a look back at the song’s success and how it came to be synonymous with the tournament. On Sunday, May 26, 1996, England were grinding out an unconvincing 1-0 win over a Hong Kong Golden Select XI on their infamous pre-Euro ’96 trip to the Far East – a tour overshadowed by incidents off the field. Back home that day there was better news for England and the Football Association, as their newly-released official song of Three Lions went to number one in the UK charts. For comedy duo David Baddiel and Frank Skinner – who had recorded the song with Ian Broudie of The Lighning Seeds – being part of a number one single was an unlikely dream realised. But the song’s true success was still to come. 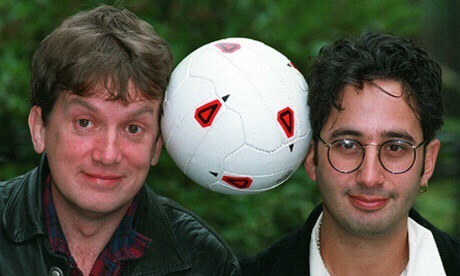 In 1996 Baddiel and Skinner were at the height of their Fantasy Football League double act fame, with the show having run for three series since 1994 on the BBC and with more episodes to be aired during Euro ’96. It was also a golden point for Britpop, including The Lightning Seeds. Liverpool fan Broudie, whose Life of Riley tune was regularly heard on Match of the Day for goal of the month/season competitions, was approached by the FA about writing its official England song for Euro ’96. He in turn sought the help of Baddiel and Skinner, adding lyrics seeking to capture the emotions that go with following England. The tournament slogan of ‘Football Comes Home’ would effectively provide the chorus – being changed to ‘Football’s Coming Home’ so it would scan better. It proved a good move. The song genuinely set out to convey what supporting England can feel like. Although the glory of 1966 was referenced a few times, the invariable pain and frustration that goes with following them also figures strongly. It is more about hoping glory could happen than the usual guff about how it’s our time to triumph. ‘I know that was then but it could be again’ smacks of hope more than expectation. With it being the official England song, the FA did insist on certain lyrics being changed. ‘They don’t know how to play’ became the more upbeat ‘but I know they can play’; ‘Terry Butcher at war’ in reference to his famous bloody image against Sweden was taken out, being replaced by ‘Bobby belting the ball’ about Bobby Charlton. But the song was still mainly the one Baddiel, Broudie and Skinner had originally penned. One player who did fall in love with Three Lions was Paul Gascoigne, who insisted on it being played on the coach to matches and was reported to have requested to DJ mate Chris Evans that it featured prominently on the playlist at his wedding reception shortly after the finals. Putting this into context, one doubts any England player tying the knot in the wake of Euro ’88 was dancing away to the much-mocked team song of All the Way afterwards! Frank Skinner and David Baddiel enjoyed big success as a partnership in the mid-1990s. The song’s initial success was not due to how the team were performing as it became number one prior to the tournament, occupying a top spot previously reached with Back Home (1970) and World in Motion (1990). But its growing popularity and return to number one on June 30 – against general trends – almost certainly was, being boosted by sales in the week England appeared in the semi-final. The match against Germany of course ended in penalty heartache for England, one line in the song of ‘all those oh so nears get you down, through the years’ ringing true perhaps more than ever. Baddiel and Skinner stood there numb at the end, in keeping with how millions of others felt. The dream dies for England. “I was so sure we were going to win it,” reflected Skinner in his book. “Imagine how they would have sung the song at the final. I have many a time. Football did come home, but someone had parked a big Audi across the driveway.” It had been an almost perfect summer for Skinner, but there would forever remain that nagging pain that it hadn’t quite been complete. At the end of the final episode of Fantasy Football on the BBC broadcast two nights later, there was another rendition of the Three Lions – sung in a more downbeat manner to reflect the disappointment over England’s loss. But England’s exit wasn’t the end of the song’s popularity. Further requests to sing it would follow, including at the BBC’s Sports Review of the Year. It would also gain a surprising fanbase in Germany, with Three Lions almost becoming an anthem for the competition (poor Mick Hucknall would find his official tournament song swiftly forgotten). Two years later came Three Lions ’98, providing updated lyrics for the World Cup in France – “no more years of hurt” among them. 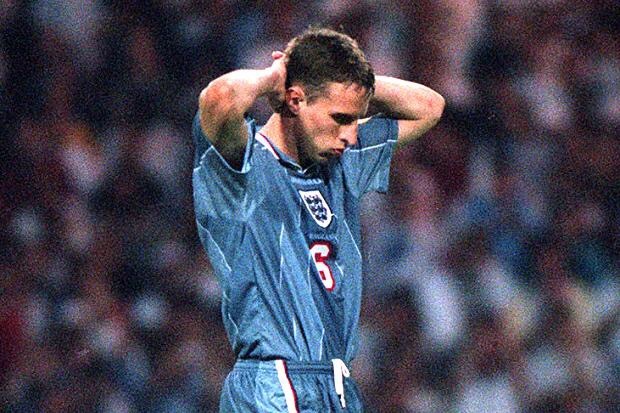 By focusing more on the current crop than two years earlier the song would unfortunately already seem out of date by the time of the finals, as Paul Gascoigne and Stuart Pearce – both referenced in the song – were not part of the squad. Yet Three Lions – which this time around was not the official England song – would enjoy further success as it again roared to the top of the charts amid a growing number of competing England singles including Vindaloo by Fat Les. Yet for Skinner and plenty of others, the magic of two years earlier wasn’t there. “To be honest, I wish we hadn’t bothered,” he wrote in his autobiography. “Respect to everyone who bought the ’98 version, but Three Lions was all about a specific moment in time: one hot summer in ’96 when England suddenly started playing like winners again, and the crowd had their own, specially written party piece so they could provide the perfect soundtrack.” The tournament’s slogan is certainly far better remembered because of the song’s chorus. Would we be having books and retrospective TV programmes entitled ‘When Football Came Home’ but for Three Lions? It’s debatable. In the same way that Christmas hits are played every December, Three Lions still gets airtime come major tournaments. But as Baddiel himself reflected in 2014, it isn’t sung as much these days by England followers. The continued failures of the team have hardly fostered a belief that they will finally deliver, with 30 years of hurt having made way for the current 50 years and potentially more. The ’30 years’ line is the one thing that really dates the original song and reminds us that it was written for Euro ’96. And that is what this blogger will always remember it for, helping make the tournament particularly special.